Since everyone’s on the same hot topic these days, which is who will be the next Bravo TV network's Top Chef, I thought I’d mention that if you (yes, I said YOU) think you’ve got what it takes to be a contender for the title of Top Chef Season Three, then here’s your chance. Fill out this application and head on down to the French Culinary Institute here in NYC on Sunday, January 28th at noon with a résumé, photo/video, certificate of veracity, and the desire for this much-sought after reality TV show prize. And please, try not to get too "smoked" (or should I say "buzzed"?) by the recent allegations surrounding the show’s shapely host, Padma Lakshmi. (Jeez... enough already.) But in case anyone's still interested, yes, Padma really is married to the controversial and sometimes renegade author Salman Rushdie. So if you’re game, by all means, go on down and sign on. With close similarities to the unsuspecting soap opera actors who, at any time or anywhere, just might get confronted for being the evil cad that everyone loves to hate, it has been reported that Marcel Vigneron of Las Vegas, voted by some as this season’s Top Chef competition’s Most Irritating, was recently attacked while out partying with friends, and needed to be rushed to the hospital for stitches. As reported in today’s NY Post, Vigneron, who is now in the final stretch for the coveted title of this year’s Top Chef on the Bravo network, ended up with a sizeable scar over his left eye. According to Vigneron, a girl came up to him in a nightclub and asked if he was Marcel from the top-rated reality show. But before he could answer, a bottle struck him, and friends had to rush him to the hospital for a total of 30 stitches to close the wound. Not that Vigneron is any stranger to being manhandled by his own fellow Top Chef contenders. Clearly, last week’s episode when he was thrown to the ground, and nearly had all his hair shaved off by his opponents is a perfect example of how hot it sometimes gets for Vigneron. In any event, read more about what Vigneron told the Las Vegas Weekly regarding this unfortunate incident here. And of course, to coin the old Campbell's Soup slogan: Soup is still good food. So check out the link above for several soup ideas for a satisfying January and February supper. And hey, if those 70 degree F temperatures just happen to return, well....you're on your own. In the tradition of endorsing food and food-related products, celebrity super chef Cat Cora has now decided to put her name behind what’s ultimately left -- after a sumptuous meal. The food disposal system, InSinkErator has enlisted the Food Network star as their official spokesperson in connection with the Evolution Series food waste disposers, now available nationwide. And as any first-rate product endorser would or should, Chef Cora will continue to help the company educate consumers and the media about the products’ improved grinding -- and quieter performance. Just a reminder that Share Our Strength has partnered with The Sun WineFest '07, the largest food and wine fest in Connecticut that is taking place at the Mohegan Sun hotel from January 19-21, 2007. The Fest will feature a Celebrity Chef Dine Around on January 20, where world-famous chefs, television celebrities, cookbook authors and celebrated restaurateurs come together to prepare signature dishes. And, a portion of the proceeds from the Celebrity Chef Dine Around serve to benefit Share Our Strength. So check out all the info on the above links, and as always, if you can make it -- ENJOY. For decades his renown restaurant in the heart and soul of New York's theater district was the place to see... and "be seen." So of course, it was truly sad to read the lengthy obituary in the NY Times this past week on Vincent Sardi Jr., one of the last bastions of the great old-time restaurateurs. 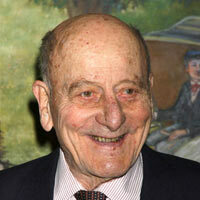 Sardi died on Thursday in a Vermont hospital at age 91. His beloved Sardi's theater-district restaurant, with its famed caracatured wall of celebrities, was the nerve center of the Broadway world, and clearly, no celebrity chef, design team, or carefully cultivated staff could ever re-create the kind of atmosphere that he alone produced. Happy 2007, one and all, and it looks like reality TV will be starting us off over at the Food Network channel with chef extraordinare Robert Irvine and a new show called Dinner Impossible, premiering on Wednesday, January 24 at 10pm/9c (check your local listings). Irvine, who has cooked for the British royal family and four US presidents, and his two sous chefs (ironically both named "George") will be put into (yeah...you guessed it) "Mission Impossible" types of dilemmas, where they'll have to prepare gourmet food while overcoming various obstacles. For example, one episode will feature the chefs having to shop for and prep dinner for 150, to be served on a train -- assuming that they don't get left at the station. Another will feature the chefs cooking with 18th century equipment and utensils, also on a tight timeline. Basically, the chefs won't know where they're going, where they'll be working or who they'll be cooking for until they get there, and will have to cook the best food they can under the circumstances. And while it does sound just a tad familiar -- it also sounds like the kind of stuff that will easily make some of the Quick-Fire and Elimination challenges over at the Bravo Network's Top Chef look a bit tame. But unlike Top Chef, no one has to be vote-off at the end of each episode, so it should make this all the more interesting.